Hotel Villa Pannonia is situated on the Venice Lido, just 300 m. from the boat station, Santa Maria Elisabetta. The building dates back to the early 1900’s and was used as a summer residence by noble East European families, who enjoyed the famous beaches of the Venice Lido. 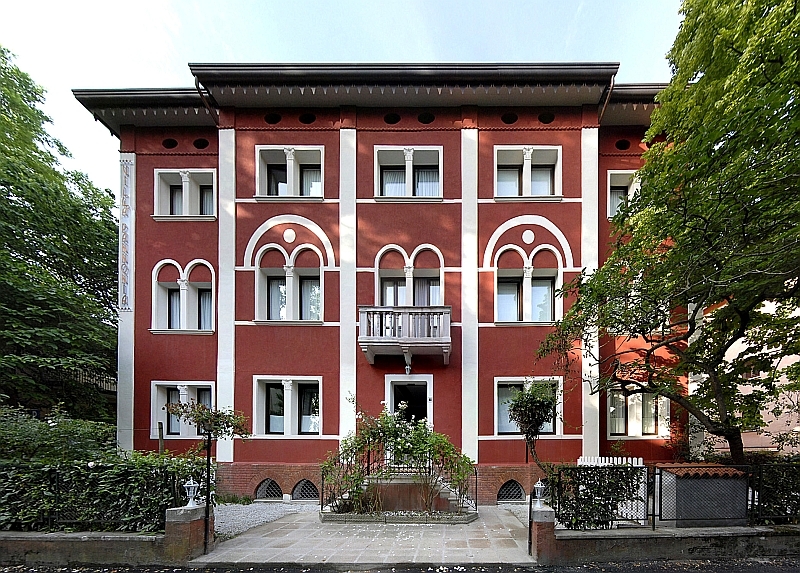 The historical façade, belonging to the eclectic period at the beginning of the century, is tinted in a typical Venetian red; an abundance of windows with pointed arches overlook a splendid garden which is at our clients disposal for complete relaxation. Traditions and modernity harmonise in Hotel Villa Pannonia, Venice Lido; the classic setting enhances the innovation and design which abounds in the avant-garde atmosphere, furniture and objects have been created by famous designers. Within the hotel, a continuous and stimulating art exhibition has been dedicated to contemporary artists. A rich and wholesome breakfast is served either in the garden or the elegant breakfast room, or upon special wish in the room. A small library is available to our guests. Within each of the thirty rooms, a fine sense of equilibrium and taste abound, enfolding its clients in a warm chromatic atmosphere.